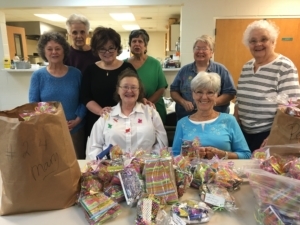 Trinity in Dothan, AL, yearly prepares Easter bags for homebound and nursing home patients in the county. This is their 3rd year, and the response has been wonderful and touching. These bags given at Easter are so unexpected, unlike at Christmas, when these people frequently are remembered. The bags are filled with items such as small pads of paper and pens, tissues, hand lotion, lip balm, sanitizers, candy, and more. The last two years, about 100 bags have been distributed. These ladies attend a Friday craft group that also makes items to be donated for the yearly Christmas Bazaar, which helps fund our benevolent fund. This group is a combination of church members and members of the community. Many of these ladies also participate in the bi-monthly quilting group that produces about 300-400 quilts a year, along with homeless and walker bags given to various agencies and individuals. Trinity believes in serving the Lord by serving the community.